Kin Care Mouthwash contains aloe vera, pro-vitamin B5, vitamin B3 and betaine for regeneration, hydration and relief for sore, dry or inflammed oral areas. 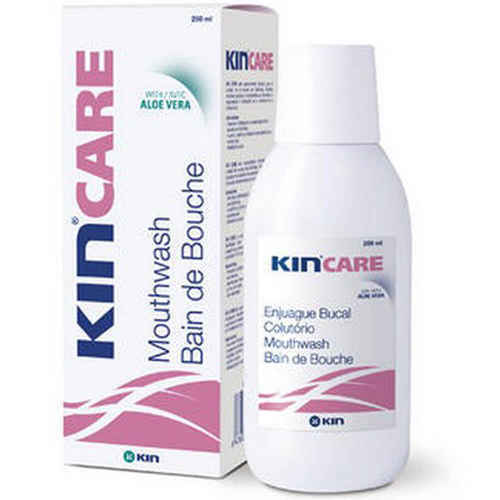 In addition, Kin Care Mouthwash contains two antiseptics - Chlorhexidine Digluconate 0.05% and Cetylpyridium Chloride to prevent infection of damaged areas. * Ulcers, canker sores, and blisters in the mouth. * Patients undergoing chemotherapy, particularly those experience pain and ulcers due to oral mucositis. * Patients with oral areas affected by Lichen Planus. * Aloe Vera well known for its hydrating and rejunevating properties. * It contains Cetylpyridium Chloride 0.05% which is an effective antiseptic in the prevention of the growth of the microorganisms in dental plaque, promoting correct maintenance of gingival tissue. * Alcohol-FREE Mouthwash - No drying or irritation of mucosa. No burning of gum tissue. Suitable for oncology patients and dry mouth sufferers. * Pro-Vitamin B5 - Helps to reinforce epithelium and mucous membranes, providing comfort. * Vitamin B5 - Protective antioxidants effect. Promotes collagen formation revitalising gum issue. Rinse for one minute, at least twice a day with 15ml of undiluted Kin Care Mouthwash. We recommend not to ingest food nor beverages until half an hour after its use. Do not swallow.